Excessive heat generation is one of the main reasons why light-emitting diodes fail. 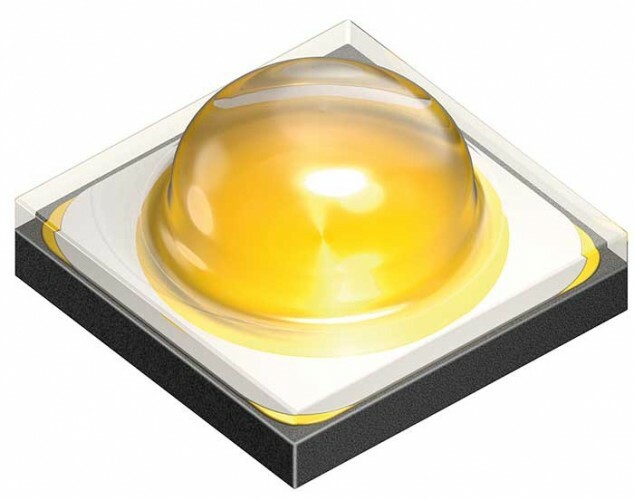 With the Oslon Square, Osram Opto Semiconductors presents an LED that withstands high ambient temperatures particularly well. To ensure that the colours of several LEDs in a luminaire remain uniform even at higher temperatures, they are measured and binned at 85 degrees Celsius (° C), a temperature that comes very close to that encountered in lighting applications within buildings, in everything from spotlights to retrofit light sources. Osram has optimized the heat dissipation of the Oslon Square to allow an increase in the junction temperature. "With our new conversion technology, we can produce significantly thinner converter layers. The thinner layers better dissipate the heat, thus enabling the higher temperatures in the LED," says Ivar Tangring, SSL Product Development at Osram Opto Semiconductors, explaining the advantages of the innovative technology. With that, the Oslon Square can reach a lifetime of considerably more than 50,000 hours even at high temperatures of up to 135° C in the LED. such as luminous flux or colour stability, which they need to optimally define the properties of their products. Furthermore, the improved temperature behaviour leads to higher luminous efficacy in the application. "This luminous efficacy, meaning the ratio of luminous flux to applied electrical power, helps our customers to significantly optimize the price/performance ratio of their luminaire solutions," Tangring emphasizes. Thanks to the higher permitted junction temperatures, fewer large heat sinks are required, and this simplifies the design of lamps and luminaires, because they can be smaller and therefore less costly. The Oslon Square is particularly suitable for the various applications in buildings. With a colour temperature ranging between 2,400 and 5,000 Kelvin, it can generate either warm- or cold-white light. The colour rendering index is over 80 and the luminous flux is an impressive 202 lumens (lm). Product variations with a different colour temperature spectrum and higher colour rendering indices are to follow. At present, the new LED is undergoing extensive quality testing: The certification process under the LM-80 long lifetime standard is underway. The results of the 3,000 hour test are expected at the end of the year, those of the 6,000 hour test in Spring 2014.